← Making Friends and Breaking Pringles, the Exciting Conclusion! May The Best Team Win? 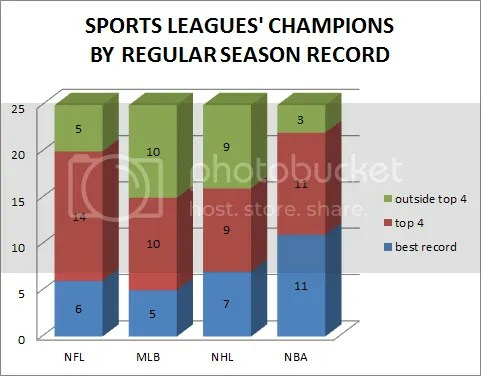 Driving home today, there was an interesting discussion on sports-talk radio about championship teams in various sports. The genesis of the discussion was the lingering anger/disappointment/jealousy we Phillies fans harbor over the Saint Louis Cardinals winning the World Series this year (the stereotype is true….we are generally angry people). Despite having the best regular-season record, and the best record in team history, the Phillies were out in the first round. Part of the discussion centered around the wild-card in baseball, and how the introduction of the wild-card (and more next year), makes it far more difficult for the “best” team to win. This stands in contrast to the NBA, where the best team is not often upset early, and the NFL, where the byes give a large advantage to top teams. Some interesting trends here. The host on my local sports-radio channel was making a compelling argument this it is easier to win if you are a top team in the NBA, and the numbers bear that out. Also, note how poorly the team with the best regular-season record in major league baseball fares. What is the probability you win the NBA title, give that you are the top seed? What is the probability you were the top team, given that you won the World Series? What is the probability you were the #2-4 seed, if you won the Stanley Cup? What else can you do with this? This entry was posted in Uncategorized and tagged best record, mlb, nba, nfl, nhl. Bookmark the permalink.